It seems I was in very good company when I decided to write a book about poppets and magical dolls. You can see my book on the right in the photo above. Effigy, by Martin Duffy, came out late last year and Poppet Magick by Silver Ravenwolf only came out last month. I got both of those other books as birthday presents - although the Silver Ravenwolf one only reached me in the post yesterday. Apparently stock had run out when it was first ordered, so I had to wait until it came back in again. I guess that means poppets are popular now, which is great as far as I am concerned. When I first wanted to write a book about poppets - immediately after I had finished writing Pagan Portals - Candle Magic - a couple of bookshop owners put me off. They said there wasn't much interest in poppet magic and that it had a bad reputation as just being only used for curses and the like. So, I decided to put a proposal to Moon Books to edit another book idea I had - a community project consisting of something magical to do every day. That was published as Every Day Magic - A Pagan Book of Days, last autumn. However, as soon as I finished that I went back to my poppet idea. I've always been fascinated by the magic inherent in toys and dolls. As a child, one of my favourite stories was The Velveteen Rabbit. It is about a toy rabbit that magically becomes real after gaining the love of the boy who owns him, while helping him recover from scarlet fever. When I was training to be a witch, one of the first spell techniques I was taught was to make a poppet. This was not to harm anyone - it was a wax model representing myself, to bring me good luck. I still have that poppet to this day. As you can see, my own experience of poppets and magical dolls was not as things to stick pins in to harm people, but in using them as helpers and for positive effects. It is that I concentrated on in my book, although I do go into the history of the use of effigies to curse people and include a few examples of traditional malefic spells. I firmly believe that a witch should know about curses, even if they never ever use them. 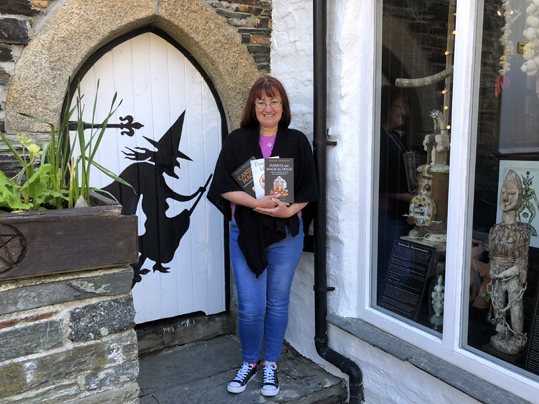 You can see a photo of me holding all three of my books outside the Museum of Witchcraft and Magic, in Cornwall, above right. I'll be posting reviews of both Martin Duffy and Silver Ravenwolf's books on my blog some time soon. You can find out more about Pagan Portals - Poppets and Magical Dolls at Moon Books website: http://www.moon-books.net/books/pagan-portals-poppets-magical-dolls and also view the book on Amazon. 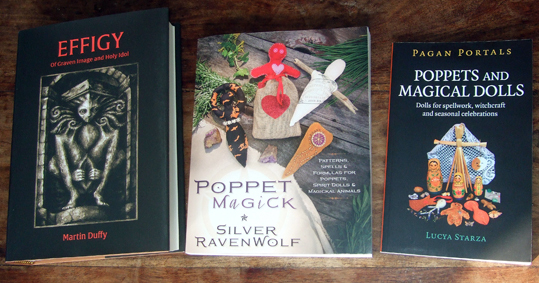 You can view Poppet Magick by Silver Ravenwolf on Amazon. So excited to get your poppet book! Pre-ordered it on Amazon a while ago. Just ordered Duffin's Effigy book today. Looks amazing! Can't wait to one day visit the Museum of Witchcraft and Magic in Cornwall. I've been lusting over it for years but alas It's over 4200 miles away from where I live in Alaska. Peg - I hope you enjoy Effigy - it was a labour many years in the making!